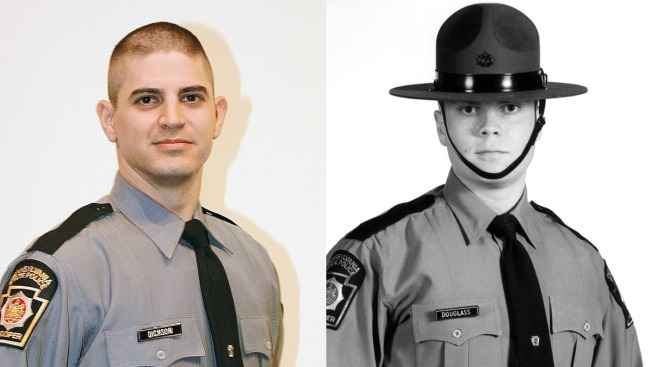 A Pennsylvania state trooper who was injured when a gunman ambushed him and killed another trooper outside a police barracks is conscious and talking for the first time since he underwent surgery, a spokesman said Sunday. State police spokesman Trooper Tom Kelly said investigators hope to soon interview Trooper Alex Douglass to get additional information on the attack. The troopers were ambushed around 10:50 p.m. Friday as one of them was leaving the barracks and another was arriving. Cpl. Bryon Dickson of Dunmore was killed. Kelly said in an emailed statement Sunday that police are getting a large number of tips, and some are "fantastic." He said they are keeping details of the investigation quiet to preserve the integrity of the leads. Investigators on Sunday returned to scour the woods across from a state police barracks where the two troopers were ambushed, leaving one fatally shot and another critically wounded. Troopers also set up a checkpoint near the site where they were stopping motorists to ask if they had seen anything that could help with the case, Kelly said. The developments come as a nonprofit group offered a $50,000 reward for tips about Friday's deadly assault at the remote post in northeast Pennsylvania. Police said there would be no news conference Sunday. or submit the tip online. Memorial contributions may be made to the Cpl. Bryon K. Dickson II Memorial Fund c/o NBT Bank 1230 O'Neill Highway Dunmore, Pa. 18512.